The Orchard Country Produce Stand at the Westminster Farmers’ Market attracts shoppers from all over Carroll County and beyond. 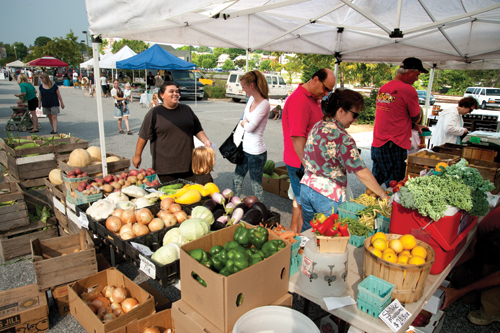 Local farms and farmers’ markets offer the freshest produce (including eggs and meats). Consumers who buy the produce support local farmers and Carroll County’s way of life. Farmers selling locally require less packaging and shipping, the food retains nutrients and gets to the table sooner, and although local farms may not be certified “organic,” they typically forgo many of the chemicals the larger producers use. All of these things promote a “green” and healthy way of life. In addition, farmers’ markets support the local main streets, drawing shoppers to the promise of garden-fresh foods, possibly fresh breakfast, and the opportunity to visit other local merchants nearby. It is a communally beneficial relationship. Many of local farmers who sell direct to residents also offer interesting activities at their farms, especially on the weekends. Some even feature petting zoos, and the farmers’ markets offer other opportunities, such as access to the county’s master gardeners. Shoppers can expect to find an abundance of locally grown fruits and vegetables in the county’s markets: Apples, pears, beets, turnips, carrots, parsnips, onions, winter squash (acorn, butternut, pumpkin), cabbage, brussels sprouts, leafy greens, broccoli, cauliflower, and possibly corn (depending on the farmers’ plantings) are a partial list of the autumn harvest. The County Department of Agriculture and Economic Development publishes an on-line link to a list of the Carroll County farms and farmers’ markets that will be open into October and possibly November. (If farms sell only through farmers’ markets, they are not listed individually. On the other hand, some farmers who sell at the farmers’ markets are willing to arrange with customers for sales, via phone or email, and pickup at the farm. (Do not be afraid to approach the farmers at the markets and ask.) Readers may also find the accompanying Internet links helpful. As always, when embarking on a shopping trip, it is a good idea to call ahead. Weather and other conditions can play a part in the lifespan of local markets and farm stands. And remember, take cash and change. Some of the stands are self-serve; you may need the exact purchase amount. Carroll County Farmers’ Market Westminster, Smith Avenue at the Carroll County Ag. Center; Saturdays, November 6-December 18; 8 a.m.-2 p.m.; Contact: Anita Bullock, 410-848-7748; FMNP Checks (WIC & Senior) & FVC Accepted. Website: www.carrollcountyfarmersmarket.com. Copper Ridge and Fairhaven Farmers’ Market Sykesville, Third Ave, Obrecht Road; Wednesday: 2:30-5 p.m.; Contact: Curt or Peggy Brothers, 410-871-1625. Downtown Westminster Farmers’ Market Conaway Parking Lot, Corner of Railroad Ave. (Rt. 27) & Emerald Hill Lane; May 29-November 20, Saturday: 8 a.m.-Noon; Contact: Stan Ruchlewicz, 410-848-5294; FMNP Checks (WIC & Senior) & FVC Accepted. www.westminsterfarmfresh.com or www.westminstermd.gov/mainstreet/mainstreet_farmers.html. Hampstead Farmers’ Market Hampstead Hampstead Volunteer Fire Company, 1341 North Main Street E; June 12-November 20, Saturday: 8 a.m. to 1 p.m.; Contact: Sharon Callahan, 410-239-8110. Website: www.townofhampstead.us. Taneytown Farmers’ Market Taneytown, 38 W. Baltimore Street; June 11-October 29, Friday: 3:30 p.m. to 6:30 p.m.; October 16: Harvest Fest, Memorial Park, 9-3 (may be last market for season); Contact: Dawn Violette, 410-507-5812 or Nancy McCormick, 410-751-1100 or nbmccormick@taneytown.org. Westminster Antique Mall Farmers’ Market Westminster, 433 Hahn Road (corner of Hahn Road and Rt. 27); Tuesday: 4 p.m.-7 p.m.
Baugher’s Orchard & Farm Westminster, Rt. 140 and Baugher Road; April 23-December 24; Daily, 8 a.m.-6 p.m., 5 p.m. after Halloween; Contact: Marjorie Baugher, 410-848-5541 or 410-857-0112. Baugher’s Fruit Market Westminster, 289 West Main Street, next to Baugher’s Restaurant; Open year-round; Daily, 8 a.m.-8:30 p.m. Contact: Nathan Baugher, 410-848-7490. Briar Ridge Farm Union Bridge, 4580 Middleburg Road; Mid June-November; 7 days a week, 9 a.m.-7 p.m.; Contact: Jim or Wendy Plank, 410-775-1855. Brice and Calvert’s Produce* Westminster, 845 Humbert Schoolhouse Road; July-November 1 (approximately); Contact: Kathryn or Charles Schaefer, 410-848-6392 or email schaeferfarm@gmail.com. Bro-Kor Valley Farm** Westminster, 1618 Bachman Valley Road; Mon-Thurs, 1 p.m.-6 p.m., Fri-Sun, 10 a.m.-6 p.m.; Contact: Curt or Peggy Brothers 410-871-1625, 410-984-7395 or email bro327@hotmail.com. Buppert’s Doran’s Chance Farm** Eldersburg, 6914 Ridge Road; April-November; May be open through December, call or check website for further information; Mon-Fri 9:30 a.m.-7 p.m., Sat, Sun, 9:30 a.m.-5 p.m.; Contact: Joe or Debbie Buppert, 410-795-6815 or email jdbuppert@comcast.net. Website: www.Bupperts.com. Carlhaven Emu Farm (emu products only) Westminster, 910 Western Chapel Road; Call for appointment; Contact: 301-854-3915 or email carlhaven@gmail.com. Website: www.carlhavenemufarm.com. Carolyn Farm & Orchard** Gamber, 3899 Sykesville Road; May 15-December 1; Daily, 9 a.m.-7 p.m.; Contact: Eva Brothers, 410-795-4228. Dawn’s Sunshine Market** Taneytown , Route 194 and Teeter Road; Summer through October (call ahead); Contact: Dawn Violette, 410-507-5812 or email redsdawnv@aol.com. De La Tierra Gardens** Taneytown, 3968 Harney Road; May-November; Please call ahead or see website for farm stand hours; Contact: Jackie Coldsmith, 443-536-3581 or email delatierra@wildmail.com. Website: www.delatierragardens.com. Evermore Farms John & Ginger Myers and Family; 150 Rockland Road, Westminster, MD 21158; Open through October 30; Products always available at farm by appointment; Website: www.evermorefarm.com. Harris Farm Westminster, 312 Ridge Road, (Rt. 27, ? mile from Main Street Westminster); July-October; Mon-Fri, 12-6 p.m., Sat, Sun, 9 a.m.-6 p.m.; Contact: Kenneth Harris, 410-848-1945. Hillside Meadow Farm* Glennville, PA, 3564 Parrish Meadow Road; Contact: Jason Gross, 717-235-9947. Knill’s Farm Market* Mt. Airy, 4001 W. Watersville Road (on Rt. 27 between Watersville Road and Twin Arch Road); April 30-October 31, November 26-December 24; Mon-Sat, 9 a.m.-6 p.m., Sun, 10 a.m.-4 p.m.; Contact: Jim or Bill Knill, 301-829-6799. Nev-R-Dun Farm Westminster, 2439 Hughes Shop Road; June-November, by appointment only; Organic Produce; Contact: Tom Reinhardt, 443-340-7212 or email tom@nevrdunfarm.com. Website: www.nevrdunfarm.com. Stokes Creek LLC*** Hampstead, 4607 Mt. Carmel Road; Contact: Steve Pelham and Deborah Strauss, 410-374-3427 or email info@stokescreekllc.com. Thorne Farm** Westminster, please call or email for directions; April-October; Open by appointment only; Contact: Greg Thorne, 443-386-0244 or thornefarm@yahoo.com. Wike Family Farm Hampstead, Stand on Route 482 near Four Seasons; Through October; Mon-Fri, 1:30 p.m.-6 p.m., Sat, 9 a.m.-6 p.m., self-serve all other times; Contact: Andy and Jessica Wike, 410-374-4801.